Since the early 2000s, Girona has become a favourite place of residence for cyclists. From Armstrong to Gesink or the Yates and Hesjedal, hundreds of professional cyclists have sprinted to Girona to take advantage of its many benefits. Girona is the European headquarters of the Orica-Scott, Cannondale, and, more recently, Israel Cycling Academy teams. You’ll even be able to enjoy seeing some professionals participate in the event. By offering three distances (100, 125 i 160 km), we hope each cyclist can take advantage of the event, regardless of their level. Slopes on passes such as the Coll de Revell and Els Àngels are not so extreme as to present great difficulty. All components of road cycling are present in these routes: descents, some difficult climbs and some leisurely ones, and flat terrain to facilitate recovery. The province of Girona, located between the Pyrenees and the Mediterranean, offers splendid landscapes. Your efforts will be rewarded with the magnificent views of the Montseny Massif, the Mediterranean Sea, and, on the other side, the Pyrenees from the summit of the Coll de Revell. The journey along the Guilleries Massif, the Pyrenees foothills, and the Costa Brava will leave you speechless. One of the reasons why Girona is so appreciated by cyclists worldwide is because the city is known as one of the sunniest cities in Europe. Temperatures are pleasant all year long. It's highly likely you'll be able to enjoy the event with sunny weather. The roads the event uses, and the region’s roads in general, are in excellent condition. As you stroll through the city, you will quickly notice that cycling culture is important when you see numerous shops and cafes dedicated to cycling such as 'La Fabrica', which has become a place of pilgrimage for cyclists riding through. Girona has welcomed the Tour of Catalonia, the Tour of Spain and the Tour of France on numerous occasions. Gran Fondo World Tour has chosen Girona to host one of the events on its 2018 calendar. The Cycle Tour will be the only GFWT event to be held on the Iberian Peninsula. 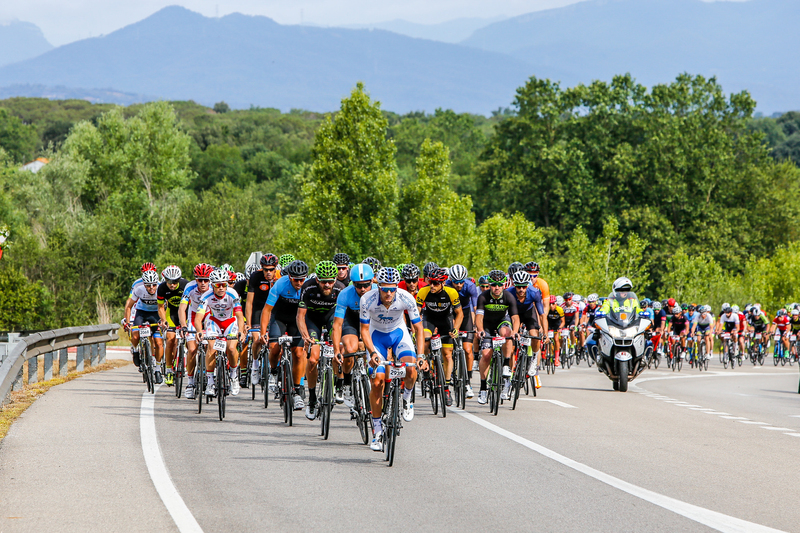 The tour brings together the best events from global amateur cycling, giving participants the chance to feel like a professional cyclist for a day while travelling all over the planet. This year, we're offering two days of events, a chance for you to discover a large part of the province of Girona and truly make the most of your stay. Completing both days is a great personal challenge. Each stage will have a timed sector that will decide the distribution of points for the GFWT. It's a chance to challenge yourself, if you wish, on two of the region's most beautiful passes. Namely, the legendary 11 km, 4% 'Els Àngels' pass at the edge of Girona and a part of the 12 km, 4% pass at 'el alto de Sant Hilari Sacalm'. Are you ready to reach your personal best? The cycle tour is only a part of the wide range of Sea Otter Europe activities. In fact, once your event has ended you can take advantage of shows such as the Dirt Jump, the short track, and competitions such as the XC Massi SuperCup race and the marathon, featuring the biggest stars in their respective fields behind the starting line. Whether a participant or just along for the ride, you won't have time to get bored in the 40,000 m² expo space. The world's top cycling brands will be featured so you can discover their latest models, which can be tested on the Demobike circuits. By registering for the 2018 Sea Otter Europe Cycle Tour, you will be able to get the International Cycle Tour official jersey. It's a must-have addition to complete your experience in cycling paradise.